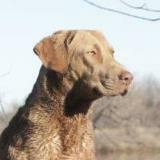 We highly recommend you spend some time learning what to expect from a Chesapeake Bay Retriever to determine if it is the right fit for you and your family. Chessies are not for everyone and you need to understand that training may be different from other breeds. It is also beneficial to read the history of the breed. Below are links to breed specific information.